occasion I have heard this talented young man accompany the choir & he has blended into this role with consummate ease. 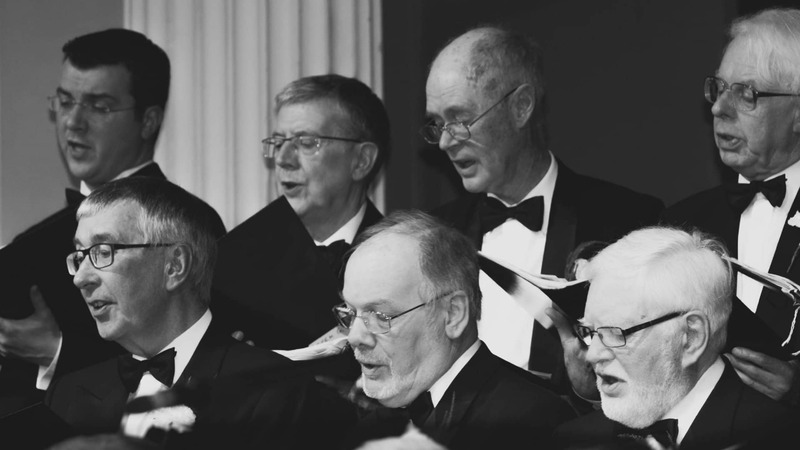 The choir had grown in numbers since the last Annual Concert & the sound was fuller & richer. New faces are always a delight to see & this would be the first Annual Concert for a number of these gentlemen-a daunting yet rewarding prospect! However under the tutelage of Mr Alex Ferguson their voices & musical talent will only improve.As Musical Director Alex Ferguson has taken the Aeolian Choir to new heights.However his programme for the 2016 Annual Concert was a major challenge to his charges.He had thrown down the gauntlet & I was interested to see how they responded. Their next three songs, Portrait of My Love, How Can I keep from Singing & Everytime I feel the Spirit epitomise the male voice genre -the choir performed these songs with obvious enjoyment. 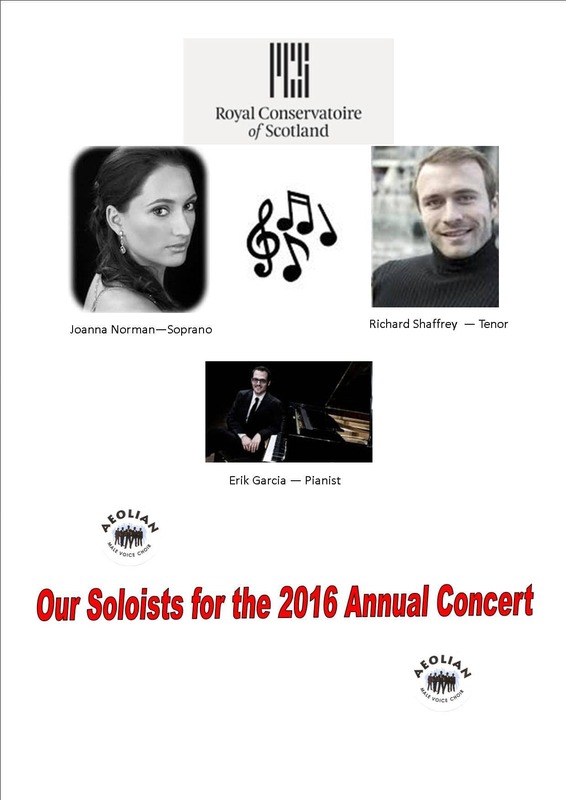 For many years I have attended this annual concert & have marvelled at the talent of the choir's guests from the Royal Conservatoire of Scotland.This year was no different as I was introduced to the wonderful voices of Joanna Norman (Soprano),Richard Shaffrey (Tenor) & their accompanist for the evening -Erik Garcia. I was enthralled by Joanna's rendition of "Carlo Nome" from Rigoletto. Richard thrilled the Grand Hall with "La Donna e Mobile" from the same opera. However it was their duets that stole the show. The bittersweet intensity of "Parigi O Cara"from La Traviata & the Romeo & Juliet appeal of the"Balcony Scene" from Bernstein's West SideStory.A feast of music to suit all tastes. They were so skillfully accompanied by Erik Garcia who added a silken touch to all the pieces.The choir's compere, Mr John Goodwin,told the audience to remember "that you first heard them in Kilmarnock".A comment I will remember. The Choir's next set started with "Bui Doi" from Miss Saigon. Richard Shaffery joined the choir for this piece & it was performed with such intensity by both choir and soloist that it must be one of the highlights of the Evening. but the mood was soon re-established as the choir gave us "Love Changes Everything" from Aspects of Love. Brian Wilson,s "In My Room" brought back memories of sunny days & the choir rose to the occasion & finished the first half with the rousing "New York New York". His hard work paid off with the added bonus of the wonderful voice of Joanna Norman. The second half was going well & it got even better when the choir performed "Leading Men"
a medley of songs that stopped the show. "Willkommen,If I were a rich man,Bring him home,Luck be a lady,They call the wind Maria"is a feast that is hard to follow but the choir gave us the wonderful "American Trilogy" to complete a memorable 2nd half. Trilogy featured a cornet solo by Hugh Fraser which left a beautiful yet haunting sound in the Grand Hall. Choir President Mr Bill Armour gave a vote of thanks which embodied the evening. For me the Aeolian Choir is like a decathlon champion.They excel in most events & underperform in a few but they are winners in the end. I will be back next year as a night at the Aeolian Annual Concert is like visiting an old friend.